My VMs were unable to access the VPN that the host was connected to. Seems rather simple... well here's the story. With this setup I was unable to access the VPC servers from my VMs. Now I would imagine there are a variety of ways to solve this. I'm sure I could have configured a VPN connection through a hacked router. Or manually added routes to route tables on the VMs and host. But... seeing how I'm not much of a networking guy, I just messed about with network adapters and found a solution! Bridged network adapters mean that the VM will use their own address on the host's network. This is great if you want to directly connect to the VM via a unique IP on the host's network. This is all good, however, the VM no longer had a static IP and I was limited to port forwarding. That's no good. So how about a hybrid solution? The solution I came up with was to add a second network adapter to the VM. The first adapter would be Bridged to allow the static IP to work and would act as the primary gateway. 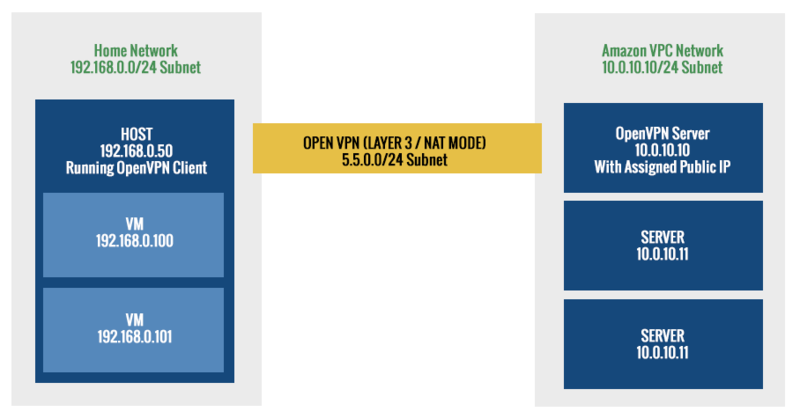 The second adapter would be NAT to allow routing through the OpenVPN Client's network adapter for the VPN network. All you need is a static route after adding the second adatper. After the adapters were configured, I changed /etc/network/interfaces in Ubuntu accordingly. With previous knowledge of the NAT'd gateway at 192.168.111.2 we can configure this route. With this configuration, the VM is routing VPN traffic through the secondary NAT adapter. The static adapter will still be able to receive network traffic on its unique IP and route traffic as usual! Problem solved. WTF! protocol version mismatch - is your shell clean?